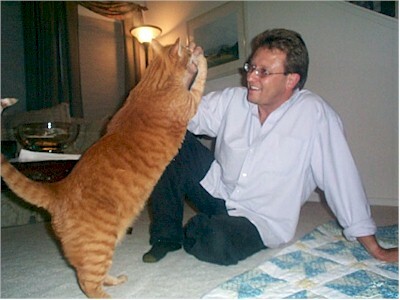 Here's my friend, Bernie, at home with his 26-pound cat, Simba. Bernie is the guy who usually substitutes for me at Miramar College when I have to be out of town. He works at a biotechnology company in San Diego and teaches a chemistry class of his own as well. Bernie's wife, Mira, made the quilt that you can see on the floor. One thing quite notable about Mira's quilts, is that she uses the exact same Singer sewing machine that Mom has. Maybe I'll take a picture of that someday.